Laraship is built on Latest Laravel version (5.5) and MySQL Database. 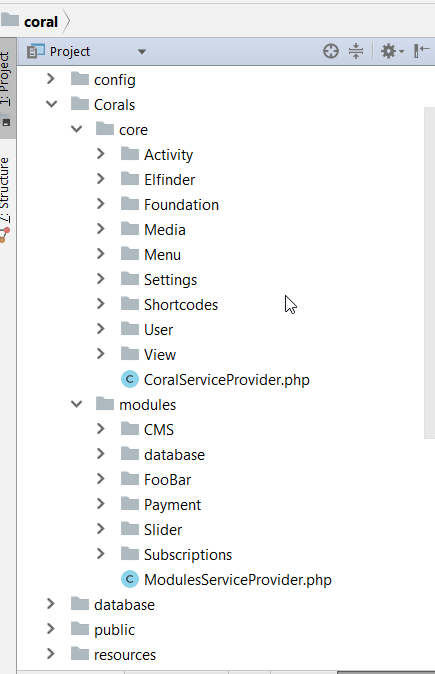 the “Coral” folders hold Laraship core and modules, developers can add extra modules and include them easily inside the plugins module which will talk about it later. Activity: this module is used for logging user activity based on preset configuration. Media: Handles Media Upload such as images and profile pictures. Menu: Menu Manager for Dashboard and Frontend with Roles Restriction. Shortcodes: an easy way to embed widgets and HTML blocks using a simple piece of a shortcode. User Management : inclused Users, Roles, Permissons (ACL) Setup. FooBar: are you looking to build your own plugin, FooBar package can be used to demonstrate plugin structure.